Nine Fabergé eggs – sold for $100m – came first, then prices soared. In 2004, Russian billionaire Viktor Vekselberg privately acquired the nine fabled Imperial Easter Eggs from the Forbes collection for more than $100m (£59m). According to Darin Bloomquist, head of the Russian objects department at Sotheby’s, the landmark sale ignited a Russian boom at auctions in the UK. 1 billion pounds is the total value of Russian art sold at Sotheby’s since 2003. 7.9 million pounds is the record price for a Russian picture at a Russian art sale: Nikolai Roerich’s radiant 1931 Madonna Laboris. 35 per cent is the annual growth in demand for Russian art offered for sale at Christie’s. Since 2003, Sotheby’s has sold almost $1bn (£594m) of Russian art – almost 10 times the amount sold in the previous decade. Over the past five years, the number of bidders on art priced at over £500,000 has almost doubled, while Sotheby’s last Russian Pictures sale raised £20m, a record for the period. Russian art is also booming at other auction houses: over the past decade, Christie’s Russian art sales have shown annual growth of 35pc, while sales are up 24pc at MacDougall’s. In the revolutionary era, Fabergés and other priceless art was smuggled out of Russia, an exodus of the country’s cultural heritage that continued in the Soviet period. Today, the majority of Russian art is sourced from private western collections, where it has resided for 70 years or more, and sold in London to Russian collectors, who bring it back home. A year ago in London, Bonhams achieved the world record for a Russian picture at a Russian art sale – Nikolai Roerich’s radiant 1931 Madonna Laboris, which sold for £7.9m. Sotheby’s recently sold a family portrait by avant-garde master Pyotr Konchalovsky ahead of auction for £4.67m, more than quadruple the artist’s previous record. In the past, the staple of the Russian pictures market was the 19th century, the golden era of Russian realism. Now, however, attention is shifting to the 20th century. “Modernist works are what the market appears to be moving towards, away from the more established, traditional works of the Wanderers and Ilya Repin,” Sophie Law of Bonhams says. Among them are Ilya Mashkov’s Still Life with Fruit, which Christie’s recently sold for £4.77m, and Aristarkh Lentulov, whose Church in Alupka went for £2.1m. The sales were world records for both artists. 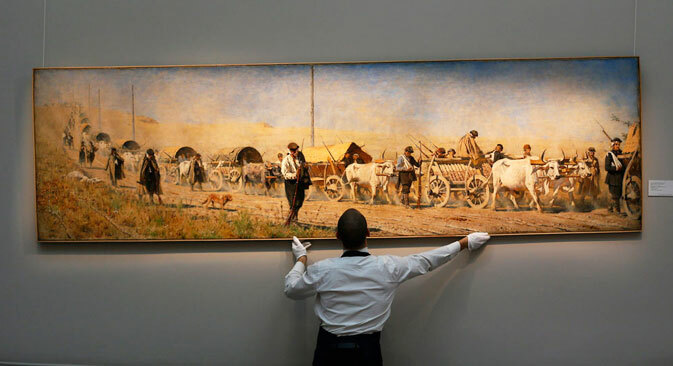 Perhaps the more surprising new development is growing interest in Soviet realist art, which is increasingly well represented at auction and in exhibitions such as Sotheby’s Soviet Sport show last winter. Billionaires Mr Filatov and Boris Ananiev are among the most avid new collectors of socialist realist works. “It’s the art of the time when I was born, of the time I lived through and studied,” Mr Ananiev says. According to Ms Lavery, one of the hottest Soviet painters today is Alexander Deneika, who injected innovative design into idealised depictions of workers and athletes. Deneika’s boldly geometric Young Designer is the brightest star of Sotheby’s forthcoming Russian Art Week auctions, where it is expected to fetch £2-£3m. The rising popularity of Soviet themes also extends to porcelain, with a Stalin-era Pioneer with a Drum figurine projected to fetch up to £35,000. Meanwhile, Fabergé and other rare art objects remain popular, but buyers are now more shrewd. “In the current market, quality is key,” says Helen Culver Smith, of Christie’s Russian art department in London. “Collectors are discerning, seeking works with strong noble, royal or imperial provenance,” she says, citing a “magnificent” pair of vases by the Imperial Porcelain Factory that will appear at Christie’s Russian Art Week sale. A Sotheby’s auction of items that belonged to the Grand Duchess Maria Pavlovna of Russia, and which recently resurfaced in Sweden, including a Fabergé cigarette case and cufflinks, brought in more than £7m, some seven times the estimate. The importance of imperial provenance extends to manuscripts, such as a 1769 imperial heraldry manuscript that fetched more than £205,000 last year at Christie’s in London. Among non-imperial items, large silver and enamel pieces that look “more Russian, more Slavic” are the major trend, Mr Bloomquist says, regularly fetching “fantastic prices” at auction houses. The vast majority of those buying Russian painting and porcelain in the UK are Russian, experts say, while westerners are generally more interested in the world-famous Fabergé. In some areas of painting, however, it’s more evenly balanced. “When it comes to the Russian avant garde, there’s no question that artists such as Natalia Goncharova, El Lissitzky and Wassily Kandinsky appeal to Western buyers as much as to Russian buyers,” says Frances Asquith, head of the Russian Pictures department at Sotheby’s.